Elana Barkhuizen, who was suspended last week after a photo she took went viral. It showed black and white pupils seated at separate tables in a grade R classroom. 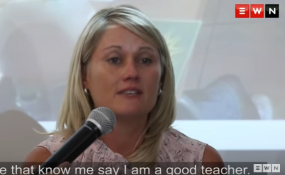 A Schweizer-Reneke primary school teacher has vowed to ensure that her name is cleared after she was suspended when a photograph, depicting pupils seemingly separated on the basis of their race, went viral on social media. Barkhuizen was suspended last week after the image emerged. In it, black Grade R pupils could be seen sitting at a separate desk to their white classmates. She was the teacher who took the photos but she did not teach that class. The teacher who heads the Grade R class has not been suspended. An emotional Elana Barkhuizen read out a statement at a briefing in Centurion . She said unsure Grade R learners on their first day at school were mercilessly exploited on a day which should have been exciting. "The result - traumatised children crying and looking at me for consolation and me trying to calm them down while my life is being destroyed," Barkhuizen said. "I do not know what the people who tried to ruin my life wanted to achieve. I just know that I had to stand and watch powerlessly how I was being judged from a stage." Barkhuizen said she had to endure insults and was told that she would never teach again. "I had to watch how people, who have never met me, tell me that they know exactly who I am. How they dragged my good name through the mud and then kept on kicking me while I was down just for the fun of it." "I will not be told what my worth is by people who do not know me. I will embark on this journey," she vowed. "I will fight. I will make sure that what happened to me will never happen to any other teacher. I owe it to my own class, my colleagues and every child in South Africa who needs good teachers," she said. "I will clear my name." Barkhuizen added that she would not allow people who had spread hate to create doubt in teachers' minds. "Teachers are perhaps the only source of love and support for so many children and teachers are some of the most important figures in children's lives." Solidarity CEO Dirk Hermann said the trade union's lawyers would approach the courts and file an urgent application to have Barkhuizen's suspension lifted on the basis that it was unlawful. Hermann placed the blame on Sello Lehari, who is the MEC for Education in the North West. "Her [Barkhuizen's] post is a governing body post. Yet the MEC, acting outside his powers, insisted on her suspension. No correct procedures were followed. "Moreover, her own class was not involved. She merely took the photo. Hence, the wrong employer acted, and in the process a teacher was suspended in error." He said that Barkhuizen's life had been ruined. "The life of an outstanding and beloved teacher was wrecked overnight by a bundu court. The teacher who is known for her kind heart and for the sandwiches she brings from home for hungry children at school - black and white alike, has been suspended by an MEC standing on a pedestal, acting in a manner that is totally unlawful." Solidarity also said that Barkhuizen had still not been furnished with a reason for her suspension and said she just received a one-liner informing her of her suspension. Hermann added that Solidarity would ask the South African Human Rights Commission (SAHRC) to investigate Lehari's actions. Spokesperson for the North West education department, Freddy Sepeng, told News24 that they suspended the right person. "The culprit was pointed out to us by the school governing body and the principal as the one who is guilty of the offence," he said. "If our investigations reveal that more people are implicated in the scandal, we will not hesitate to suspend those people. "Even if the principal is linked, we are also going to suspend the principal," Sepeng added. He promised that a report into allegations of racism at the school would be released by the end of February.